Get hot freebies daily & enter to win a $100 Amazon Gift Card! in free • This post may contain affiliate links. Read the disclosure policy. Who doesn’t love getting free Ben & Jerrys for free?! 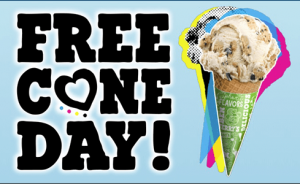 Celebrate Free Cone Day with them this April 9th! Free Cone Day is being celebrated in Scoop Shops around the world, & we’ll be giving away free ice cream at a host of locations between 12pm and 8pm! We love Ben and Jerry’s! Thanks! this tradition has been going on for as long as i can remember! Earn extra money taking paid surveys! Get FREE Amazon gift cards! Jaime is a married mom of 2 young & energetic boys. A few years ago, she made the difficult decision to leave a job she loved to stay at home with the kids - but soon realized her TRUE passion was to be at home with her kiddos & helping others save money. Now she shares the hottest freebies, coupons & deals here at Coupons & Freebies Mom.